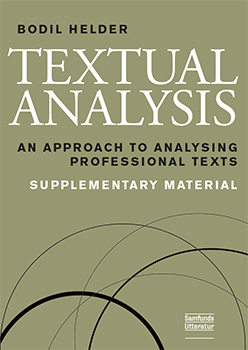 Over the years, many students have asked for examples of analyses based on the framework presented in Textual Analysis an approach to analyzing professional texts. This book is an attempt to meet that request. The book contains five examples of analyses of previous exam assignments from the CBS course Understanding Professional Texts, which is included in the BA programme Intercultural Market Communication. However, the analyses are also highly relevant for other courses in text production. The analyses presented include a press release from Lundbeck, an advertisement from Forever Living Products, a text on litigation from Philip Morris, the introduction to an annual report from Amnesty International and a value statement from Lego. The book is suitable for all communication students at university level.